Hello all, I’m Michelle mother of 3 beautiful children, I work part-time, 33yrs young, non-smoker, non-drinker, overall health is good for the most part…..Where do I even begin. I just recently received the diagnosis of cyclic Cushing’s. I’m not really sure how long I have actually had Cushing’s because I have had a diagnosis of PCOS since I was 17 yrs. old ( I’m now the ripe young age of 33). However looking back through labs with my endocrinologist who I see every 6 months, my ACTH levels have been elevated for a bit over 1 yr. It was not until recently January of 2015- things were going terribly wrong. Starting in January I started to feel genuinely unwell, on a regular basis. I cant really explain all my symptoms there were so many different sensations and feelings that were seemingly different daily. However the red flag was I was having blood pressure spikes from really high, to very low back to back. I never had any blood pressure issues so this was a concern that led me to see a cardiologist. Upon tons of testing the cardio MD felt that something was telling my otherwise very healthy heart to do this and I should see a endocrinologist. (thank goodness for him) I contacted my endo and let him know…. the testing began. I did every test: the midnightcortisol saliva test, dex suppression, 24 hr urine test, CRH stimulation testing. And I did them more than once. Each time it was a different response either, inconclusive, normal high, or high. I was then referred to the head of the Cleveland clinics pituitary department Dr. Kennedy. He said he is having a hard time believing when he looks at me that its Cushing’s. However all my labs say it is. I will say I do fit the mold of PCOS to a tee- which symptoms of that do coincide with Cushing’s but he still said we have to be sure its Cushing’s. To add to the mix I did have a normal MRI as well. Dr. Kennedy started me on a 2 week midnight cortisol saliva test- Upon completion we noted levels of cortisol all over the place, some Normal, normal on high range, high, and really high. He confirmed with all the other tests this is Cushing’s. Now we are trying to figure out what is next…. and where is this damn little tumor at. he feels that it is most likely in the pituitary from my test results, but we still are not ruling out else where. He is thinking that the next step would be exploratory neurosurgery or the IPSS. I’m not sure what to think of all this, except I want to hope for the best like everyone- and just be cured!! On a side note during all of this I also had episodes of severe pain in my chest and nausea. I went to see a GI who did an upper endo scope. They found I had eosinpphilic esophagitis. I also have never had any GI problems until now; and they came on suddenly. Im also having pain in my pancreas area- not sure if any of the two are related at all to Cushing’s. But once again I was fine until recently with all these issues at once it seems. wish me luck on further testing, treatment, and ultimately a CURE!! 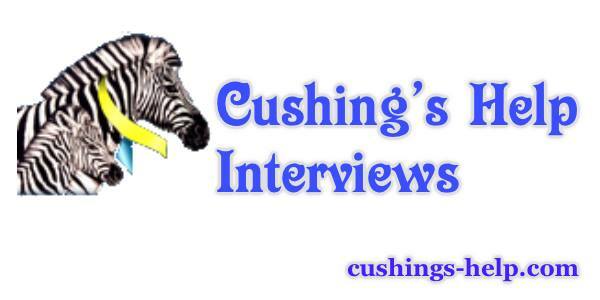 The archived interview is available now through iTunes Podcasts (Cushie Chats) or BlogTalkRadio. There are currently 83 other past interviews for your listening pleasure!